Softer and Easier on Hands and Forearms. Beach ball type design holds roundness longer. Stitched PVC volleyball-like outer layer. Standard 7" tetherball with nylon wound bladder. Swivel hook for attaching the tether to pole eyebolt. 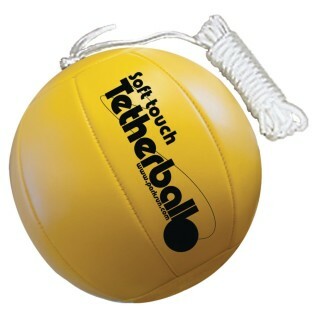 Softer than a traditional rubber tetherball and easier on your hands and forearms. Thanks to the new beach ball type design, it will hold its roundness longer than a traditional designed tetherball. The outer layer is made by stitching together panels of soft PVC volleyball type material to form a standard 7" size tetherball with nylon wound bladder. 5mm nylon tether that is 7' long and has a swivel hook attachment for attaching the tether to pole eyebolt. Features an internal cord connector and inset valve stem.